1. Wash all the vegetables. 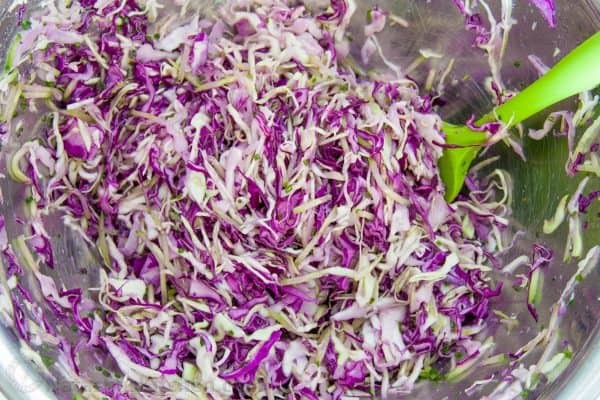 Using mandolin, thinly shred 1 white cabbage and 1/2 red cabbage and place them in a large bowl. 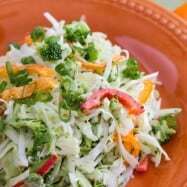 (Alternate method for shredding is using a sharp knife to finely shred cabbage; it’s just more time consuming). Do protect your hands if using a mandolin. I’m sporting my new Trudeau Oven Gloves . They are very functional; unlike a regular oven mitt where you can’t bend your fingers. Oh wait, that’s my husbands hand there; I don’t have man hands, but the gloves fit us both. 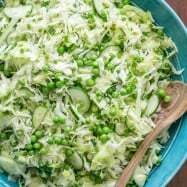 This cabbage and cucumber salad is a classic Fall salad and a staple in our home! Using sunflower oil is important. 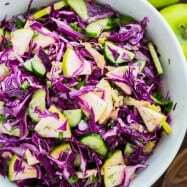 It can best substituted with olive oil, but sunflower oil really improves the flavor of this salad. Wash your vegetables. 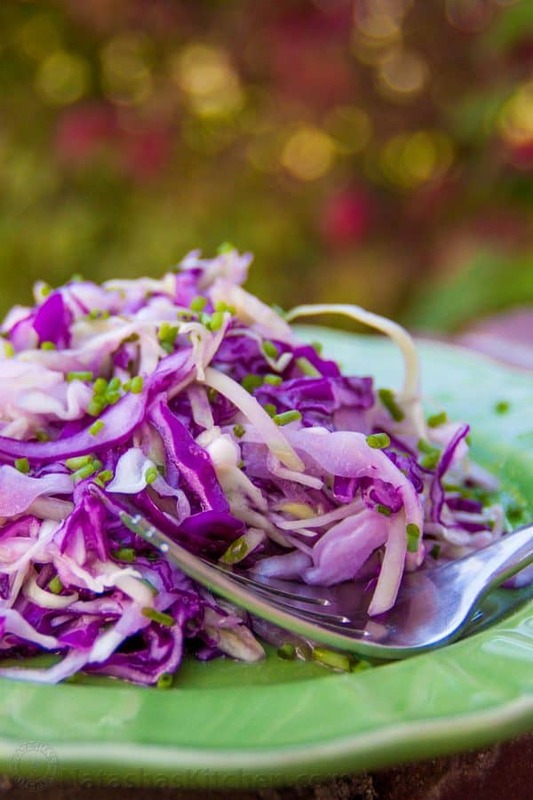 Using a mandolin or knife, thinly shred 1 white cabbage and 1/2 red cabbage. Place them in a large bowl. 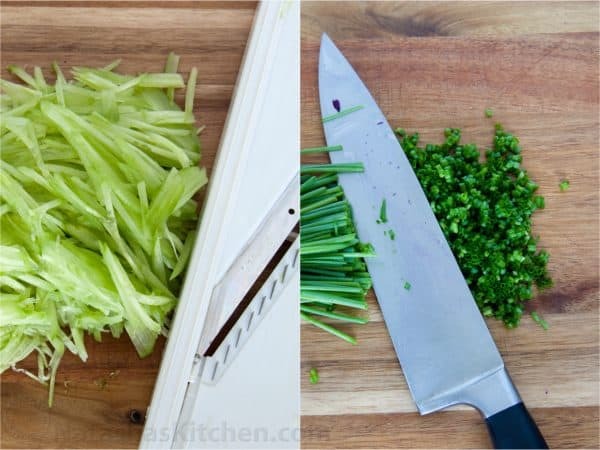 Peel and julienne 1 English cucumber and finely dice green onion. Add both to the bowl. 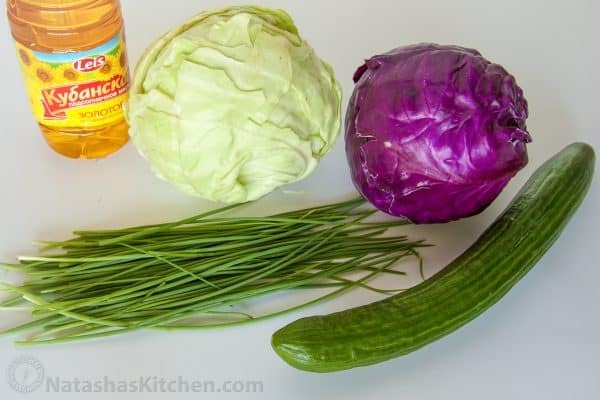 In a separate small bowl use a fork to mix 4 tbsp sunflower oil, 1 1/2 tbsp vinegar and 1 1/2 tsp salt. Stir it into the salad to taste. You may need less depending on the size of your cabbages. Thanks I pretty sure it was on FB, but I am reading culinary sites in the Your blog and the rest only in Russian. It was recipe looks as Your. I find recipe with brussels cabbage on you Blog, but not what I remember. Hi just ran across this recipe. Looks wonderful! But I have a quick question. 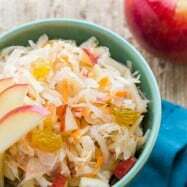 What mandolin slicer would you recommend? I thought this was too simple to be delicious….but I was wrong! I used olive oil and apple cider vinegar cuz that’s all I had- yum! Topped it with simple tuna fish, chopped cherry tomatoes, and shredded fresh arugula… Wow! OMG! This is a winner! I finally got my 5-year-old to eat something else than broccoli and carrots! Plus it was her first “mixed” veggie side dish that she was willing to try and she liked it! She called is “Crunchy crunchy kapusta”. Mix all together then pour over the salad. I love the color of the salad. It looks beautiful and I’m sure it tastes great too. 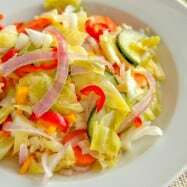 The combination of cabbage and cucumber is awesome. As you know, I am a night shift nurse too. I’ve been working night shift for many years now, and wouldn’t work as a nurse during the day. I’ve worked day shift too, so I know the difference. It’s a lot less crazier at night. No visitors, less doctors, politics, no procedures, etc. Plus, I hated waking up at 5 am. I am a night owl though and function great at night. I started working nights when I was in nursing school and it was easier than working and going to college during the day. When I got married I worked days at first but then went back to nights when I got pregnant. We don’t have any baby sitters nearby, so that was our decision so one of us could be with the children at all times. Now, I wouldn’t go back to day shift. Everybody is different though. If you have to though, there are ways to adjust. 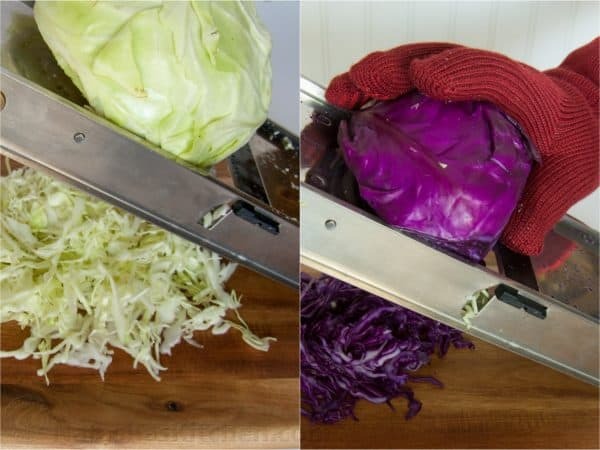 Where did you get the cabbage shredder? 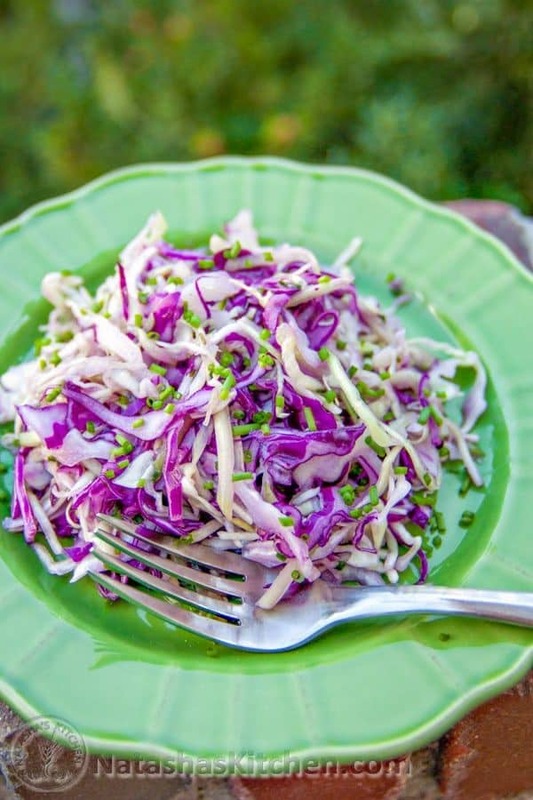 Salad sounds wonderful and I will definitely try it….now for the night shift! My mom helps me out a lot. She pretty much covers for whatever time that my husband is not available. Except for the nights, that’s all me, so just lots of sleepless nights. 🙂 And its not even the night shift that really is hard on us, it’s the weekend rotations that absolutely kill me. During the week at least one of the kids is in pre-k, but on weekends both are home and its always nice to have two parents around for different activities and lessons that are going on. But my husband works with a lot of people who would not trade night shift for the day. They sleep less, but they are their for their kids more then I am, who works 5 days a week vs 3. And more flexible work schedule, you can be there to meet your kids off the bus, where I am at work until 6 or later no matter what. So pluses and minuses to everything. A lot of day situations and sick kids are handled by my husband, who gets wokened up for any emergency, where I am in the office and only able to give advice over the phone. :):):) So there is always a positive side to the night shift. 😉 Hang in there.